Iran’s military recently publicized a third underground missile facility and showed the launch of a new ballistic missile through the top of a mountain. U.S. intelligence agencies said in a recent internal report on the launch that the new underground missile facility was disclosed by Iran in March. It was the third time since October that Tehran showed off an extensive network of underground missile facilities. The new video, however, for the first time shows a missile launch from one of the country’s underground launch facilities. Disclosure of the new video comes as Iran this week conducted the third launch of a ballistic missile since January, when the nuclear deal aimed at curbing Iran’s nuclear weapons development went into effect. 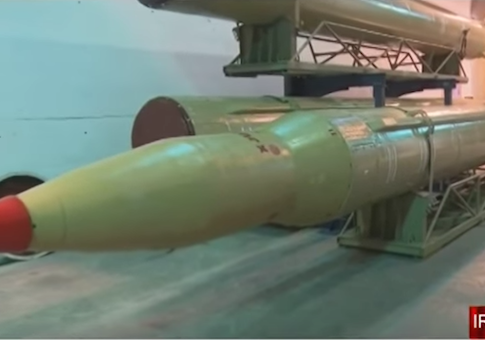 Two missiles were launched in March, including one shown in the video, identified as a Qiam-1, or Uprising-1, that appears to be a smaller variant of Iran’s Shahab-3 missile. Pentagon spokesman Peter Cook said Monday that he could not confirm the latest Iranian missile test but is aware of the reports. The Pentagon is developing special precision-guided bombs and missiles designed to penetrate reinforced deep underground bunkers like Iran’s missile facilities. "Iran has to abide by U.N. resolutions with regard to ballistic missiles tests, and if they have violated or not been consistent with those resolutions, that clearly would be a concern for us," he said. Iran has produced three videos of its underground missile storage and launch facilities that are designed to highlight Tehran’s defiance of the United Nations resolution on the Iranian nuclear deal that calls for a halt to nuclear-related missile tests. The latest video was disclosed March 9 by the Mehr New Agency, run by the hardline Islamic Propagation Office, which is in turn affiliated with the Qom seminary. The missile test was the last stage of an exercise held by the Islamic Revolutionary Guards Corps aerospace division that the report said was part of several missiles being fired from different parts of the country. The video begins with grainy footage showing an underground tunnel where missiles are stored on either side. The video then shifts to a concrete cavern where what appears to be a Qiam-1 ballistic missile is being set up beneath a launch tube in the ceiling of the cavern. The video then shows a news announcer stating that on March 8 a Qiam missile was launched "from the depths of the earth." The final scene shows a missile lifting off through the top of a mountain. Rick Fisher, a military affairs analyst with the International Assessment and Strategy Center, said the latest missile video is disturbing. "It is not likely that Iran simply figured out this method of launching liquid fueled missiles from tall caves with launch holes that reach the surface, that until launch are very well concealed from overhead surveillance," Fisher said. "It is my suspicion that this launch method was pioneered by China and if that is the case, then we need to revise our estimates of the number of DF-4 and DF-5 ICBMs that China may be able to launch at the Untied States." The concealed cave launchers allow states like Iran, China, and North Korea to hide large numbers of missiles for decades. "This method of cave-launch may also be in use in North Korea, again allowing Pyongyang to conceal a significant number of missiles from overhead/space detection," Fisher said. The Iranian missile propaganda campaign began in October when Iran disclosed a video showing an extensive network of tunnels and troops with medium- and long-range surface-to-surface ballistic missiles. The video was made public three days after Iran tested a new long-range missile that the United States said undermined a U.N resolution. Then in January a second video was released by official Iranian media showing tunnels filled with road-mobile Shahab-3 ballistic missiles and new Emad precision-guided missiles. The second tunnel video was released by the Tasnim news agency and state television. Iranian state-run media quoted Brig Gen. Amir Ali Hajizadeh, commander of the IRGC aerospace division, as saying in October the Iranians have numerous underground missile tunnels around the country that are some 1,500 feet below ground. "The Islamic Republic’s long-range missile bases are stationed and ready under the high mountains in all the country’s provinces and cities," Hajizadeh said. "This is a sample of our massive missile bases," he said, adding "a new and advanced generation of long-range liquid- and solid-fuel missiles" is slated to be deployed in 2016. The January video included footage of Iranian Parliament Speaker Ali Larijani visiting the IRGC’s new underground "missile town" where Emad missiles have been deployed. The locations of the missile tunnels were not disclosed. IRGC Brig. Gen. Hossein Salami was quoted in the video reports as saying Iran has 14 underground missile depots located at depths of between 90 feet and 1,500 feet. The underground facilities appear modeled after China’s underground missile facilities that were disclosed for the first time several years ago. China has an estimated 3,000 miles of underground nuclear and missile facilities that has been dubbed the Great Underground Wall.